To kill time on an airplane, I usually play games on my phone. I can usually squeeze a good five or six hours out of the battery. But last month when I flew from New York to Hawaii, the trip ended up taking a full 24 hours, and I was trapped on a plane for 18 of those. In an attempt to preserve my sanity, I decided to review the games in Delta’s seat-back entertainment system. First up was Animal Factory, the only game in the “Sky Kids” section. The system has Bejeweled, but apparently that’s too confusing for kids? Perhaps by “kids” they mean “the tiniest of babies”—and yet this game relies heavily on the phrase “validate your selection,” which I assume most tiny babies wouldn’t understand. I didn’t have a way to record audio, but I can assure you that Juan the Chameleon’s voice is just as disturbing as his face. Animal Factory is three mini-games that are all some twist on matching up two horrific Frankenstein monsters that Juan has trapped in large pods. One game has you piecing parts back together to create a frog or a panda, while one gives you a few seconds to look at a mismatched animal and recreate it from memory. When you’ve successfully completed a puzzle, a fly (seemingly of its own volition) flies into a jar at Juan’s feet. After you’ve collected eight flies, Juan lets them out and they begin to fly around randomly as Juan slowly eats them. I wasn’t able to help Juan eat the flies, and I wasn’t able to stop him. This ritual seemed pointlessly cruel, and took about a full minute to watch. Add in the fact that the controls for these games aren’t very responsive, and I think I’m done hanging out with Juan. The help screen says the game is copyright 2000-2012 DTI software, so I suppose I should give some leeway to the folks at DTI for the fact that this is 17 years old. Hopefully soon we’ll see a sequel that takes advantage of the latest in seatback gaming technology. Rating: A crying baby, but one that falls asleep after takeoff. This is in the “play” section of the menu, so I’m counting it as a game. I’ve been trying to learn Spanish, but since this is supposed to be for fun, I went with Icelandic. If I fail while learning Spanish, I’ll feel bad, but obviously I’m going to be terrible at Icelandic. Life is about lowering your expectations. There are a few different games which are all to be variations on flashcard-type exercises. The dialog game offers a picture and a word, then asks you to match them up after running through the combinations once. You get a score, so that technically feels like a game, but it’s pretty boring. Also, Icelandic is an interesting language, but we hit turbulence and memorizing words like “svefnherbergi” isn’t really fun while simultaneously looking for your seatbelt. Kasparov Chessmate has a multiplayer option, but the lobby is empty. I’m not going to sit and wait for an opponent, and playing against a bot seems like it’ll take forever since I’m awful at chess. I’ve got more games to review and we’re already halfway across the Great Plains.I’ll have to punt on this one. This also has a multiplayer option, and it carries over your name from the other games. That’s actually a really cool feature! Sadly, the lobby is empty again. The graphics are pretty disappointing, even for a fifteen-year-old game in the headrest of an airplane. Mixing low-poly terrain and sprites is fine (it worked for the Nintendo 64), but at least get some better textures in there. Look at those trees! What’s even happening with that group in the middle? I’m pretty sure I’m about to drive the ball into a hole in spacetime. This interpretation of events is supported by the fact that when you hit the ball, the sprite doesn’t get smaller as it goes into the distance. It’s really strange to see a golf ball that’s half the height of the flag. Golf isn’t exactly the most compelling sport for a videogame in the first place, and porting it to a seatback entertainment system doesn’t improve on that at all. I think I’m going to move on from this one. This game, like some of the others I’ve played, was ported by a company named DTI Software. I checked when the flight landed, and based on DTI’s Twitter account and expired website, things aren’t going so well for it today. But a PDF I found says it developed around two hundred airline games, including Sega classics like Altered Beast and Golden Axe. I could have been playing Golden Axe but got stuck with Animal Factory? Thanks for nothing, Delta. The Bejeweled port is fine, but the seatback screen isn’t very responsive, so it’s lacking the polish that helped make the puzzler so popular in the first place. Probably not DTI’s fault. It’s a bit like when different companies would make the same game for NES or Sega, and you were stuck with whatever version you had. The major difference being I’m physically trapped with this “console” for the next three hours. Now we get to the good stuff. Caveman seems to be an original IP from our friends at DTI! 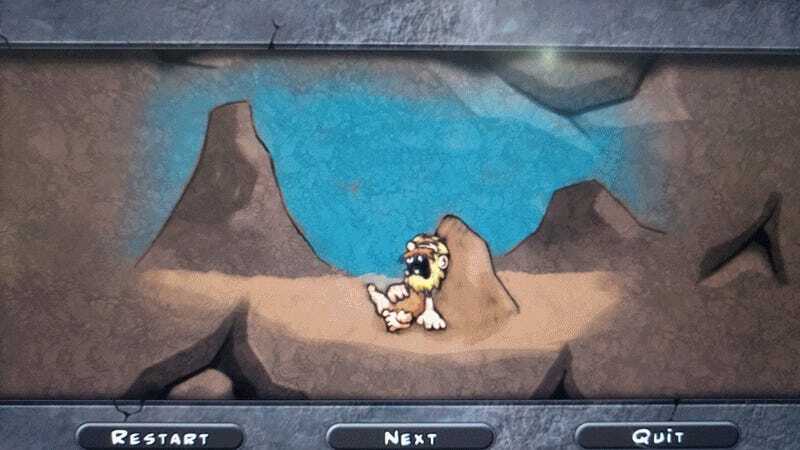 It’s a puzzle game about a caveman (named Caveman) who is running from a lava flow and decides to hide in a hole. Then he has to find another hole to go deeper—which, just to be clear, is where lava comes from. So this game definitely ends with him dying. First of all, how can you not love an airline seatback game that has an opening cutscene, even if it is a slideshow? Every level has you navigating a maze filled mostly with blocks that can only be pushed in two directions. The help screen is actually incredibly long and it seems like there are more mechanics that come later, like wild animals to avoid and warp gates to skip ahead. 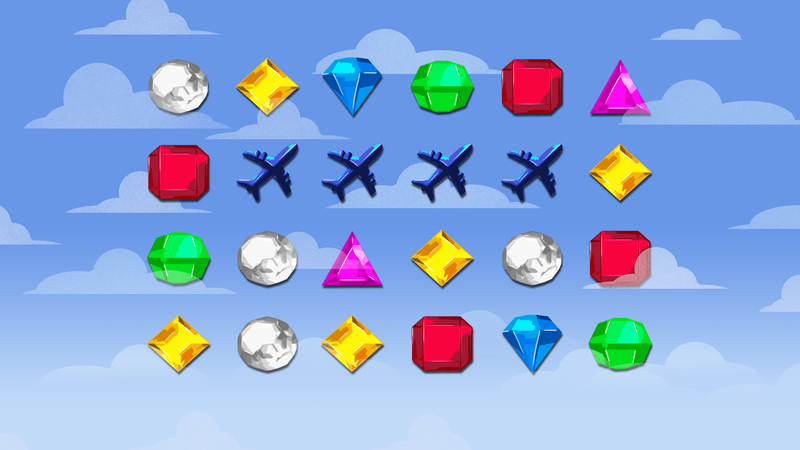 Sadly, I only got three levels in before my plane landed. There’s a password system, so if you find yourself on a Delta flight and want to skip the tutorial, use the code CHEAT. I had planned to type up my notes on the next flight from LAX to Honolulu, do some work, then relax and watch a movie. We’d missed our original connection, but were put on another flight that hadn’t departed yet. 20 minutes after we boarded, the pilot announced that the plane had mechanical problems. This is when we realized why we were able to get on a new flight so quickly: the other passengers on the flight had been waiting for eight hours for this one to depart. You really don’t appreciate how many seats are on an Airbus A319 until they’re all filled with very angry Hawaiians trying to go home. We were put on a new, less broken plane. Good news: It functioned. Bad news: It had even more seatback games. Worse news: No Caveman, which broke my heart. Looks like I had more work to do. I don’t know if it was just because I was so tired, but Bird vs. Bird was way harder than I expected. You just place a black bird on a perch until you’ve blocked off all the orange bird’s paths of escape. It should be simple. After five tries I figured out that the orange bird always goes up and left. I don’t know if he’s an idiot for doing it, or if I am for playing this game. This is actually a pretty solid ripoff of the extremely difficult platformer The Impossible Game. You’re a triangle, not a square, and instead of one endless level of precision jumping challenges, it’s a long series of single-screen levels. The framerate is solid (unlike that horrible bird game) and it’s got a fun chiptune-style 30-second loop for background music. The controls are responsive enough that I was only frustrated by my own failings and not the seatback screen’s, which was a nice change of pace. Twitch-based games are especially hard to play during takeoff, and especially when you’re trying to film it with your phone in one hand. But I guess that isn’t the game’s fault. I actually finished Dodge Bloxx. The biggest problem is that the difficulty curve is all over the place: Several levels are ruined by auto-fail obstacles that crush you, then stay down for subsequent lives, making it impossible to get a perfect run on your first try. I could imagine playing through again to get a high score on a long flight. I wouldn’t do it but I could imagine it. A weird cross between Bomberman and Pac-Man. There are sheep who start in a pen like Pac-Man ghosts, but when you touch them, they die and you don’t. The lack of an enemy that can kill you makes the “shoot” and “place bomb” buttons even more confusing. I tried them, but nothing was shot and no bombs were placed. On top of all that, the touchscreen controls are extremely annoying, so I’m just going to leave this one a mystery. I was extremely sleepy and had been traveling for about 18 hours by the time I loaded up Hue Drops, which is why it took me a long time to figure it out. You start with one dot, and you can change the colors of the adjacent dots. It’s like playing with the paint bucket tool in MS Paint! You slowly change the color of the entire board one section at a time. Who would’ve thought that would make a decent game idea? You know what, I’m going to go ahead and say it: I’d pay a dollar to play this on my phone. And I believe that’s the highest compliment one can pay a game in 2017. I’ve never heard the term French Solitaire before, but I’ve definitely seen this game before under names like “Hi-Q.” You know the one—there’s a wooden board of pegs or golf tees with one empty space, and you remove pegs by jumping over them with others until you can’t move any more. This is a perfectly acceptable version of that game on the platform it was always meant for: one that you’re trapped in front of for several hours. As we came in for our final approach, I had a pounding headache because I should’ve been sleeping the whole time, so the pressure was really on. Time for the lightning round! Trivia about countries around the world! Pretty fun, and you learn some interesting facts. Hard to mess up a trivia game, so it’s a great choice. It’s Bust-a-Move! The controls are really frustrating to use, but bearable if you’re really into it, or really bored. I was neither. Next! This game has the most intense description, but it’s just a game where you navigate a maze. There are computer opponents racing you, and they’re way better at mazes than I am. Especially after twenty-two hours of travel. Luckily, the plane is landing, and I’m finally free from the darkness of my own personal travel labyrinth! I was actually surprised to find all the original games that had been made specifically for airplane seatback screens. I wish they had been better, but I don’t regret my time spent with Juan, Caveman, and the rest. I do hope next time I’m on a plane I get a chance to see how Golden Axe plays with a touchscreen that someone is sleeping on. Steve Marinconz reviews things that nobody cares about and didn’t know existed. You can follow him on Twitter.